Prototek Manufacturing can deliver your parts fast! P Prototek Manufacturing is a family owned company since 1987. We serve serve customers throughout the United States, Canada,Europe and beyond. Prototek Manufacturing presently has 2 turning centers, in which we can handle all of your turning needs. We have a Mori Seiki SL-15 to handle long running jobs it features a 1 5/8” thru spindle, a 12 station turret, with speeds up to 6000 RPM and a Yasnak LX3 control. In this machine we can turn up to 7.900” in diameter and up to 18.50” in length. 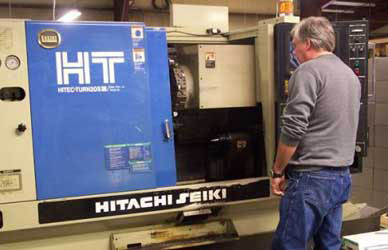 We also have a Hitachi Seiki hitec-turn 20SIII, this machine is designed for quick turn parts it has a Yasnak multi L control. This control lets us program the machine of the fly using its conversational program package. With this machine we can turn your parts up to 13.500” diameter and 15.000” in length. It features a 2.000” thru the spindle, a 12 station turret and turning speeds up to 5000 RPM. With these 2 machines Prototek Manufacturing feels we can service just about any customer that calls on us.